Swimming across a stretch of open water in what we can only hope were highly supervised conditions is far-removed from that life-threatening Dickensian practice. However, when five-year-old boys (or rather their parents) speak of laying down the gauntlet to seven-year-old boys to see which is fastest and capable of a 6km sea swim, you have to wonder about the sanity of it all. 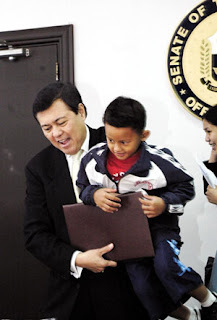 After successfully crossing the Mactan Channel, Justin Daniel Junio, a five-year-old from Manila, now wants to challenge the record set by Braxton Bilbrey, a seven-year-old American boy who became the youngest swimmer in May to cross a 2.25km stretch from Alcatraz Island to the shores of San Francisco, California. Young Justin swam for almost two hours to cover the 6km crossing of the Mactan Channel last Sunday. Ma. Vilena, the boy's mother, told her local Inquirer that the family is now working on plans to travel to the United States to challenge Bilbrey. Someone needs to finance their trip, accommodation and "Justin's training". Let us pray no fool with his money comes forward. "If we go to the United States, my son has to be trained for the weather and water temperature. The weather and water temperature there are different and Justin needs a suit for that. We are afraid he may suffer from hypothermia if he does not train there," said Justin's mum. There is no question that her son is being properly cared for: he showed no signs of fatigue from his effort, reports suggest, while October 15 brings an appointment with his "medical team at the Philippine General Hospital", to check that all is well. His father, Florencio, is a retired Air Force colonel with the Philippine Air Force. The family took a tour of the mayoralities of the cities of Lapu-Lapu, Mandaue and Cebu as a way of saying thank you to the Cebuanos for their hospitality during Justin's big swim. The family are now planning to live in Cebu. There is no impediment to encouraging children to swim across a 6km stretch of open sea. To turn that into a competitive pursuit for pre-school kids, however, could attract those who have far less regard for the welfare of their children than the Junio family does. Meanwhile, young Justin should be having so much fun (beyond the glare of publicity) that by the time he's 15 it proves impossible to drag him away from the water form at least another 15 years, if not a lifetime.